Baby (Ansel Elgort) decides to leave his life of crime behind when he meets the love of his life, Debora (Lily James). However, being the best in the business causes problems for Baby when his crime lord boss, Doc (Kevin Spacey), won't let go without a fight and insists on one last heist. 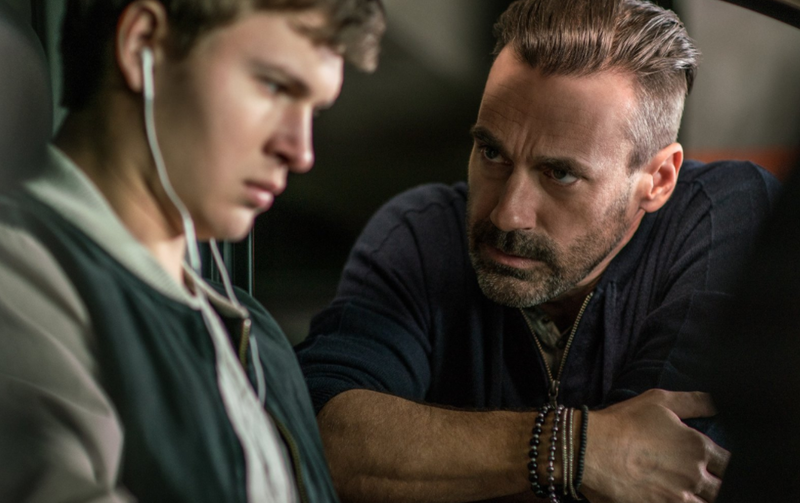 It took twenty-two years to make it to the Big Screen but Baby Driver has arrived. Writer-director Edgar Wright (most famous for TV cult classic Spaced and the Cornetto Trilogy films) initially had the idea back in 1995 when listening to The Jon Spencer Blues Explosion. 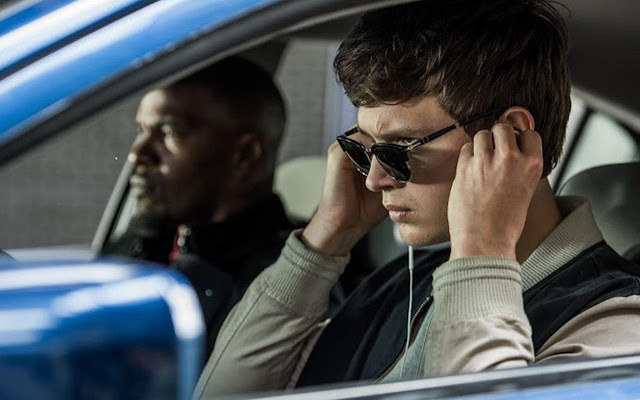 Believing it to make the perfect car-chase song, more than two decades later the song plays into the ears of a getaway driver who can only drive whilst listening to music; in one of the most original films in years. 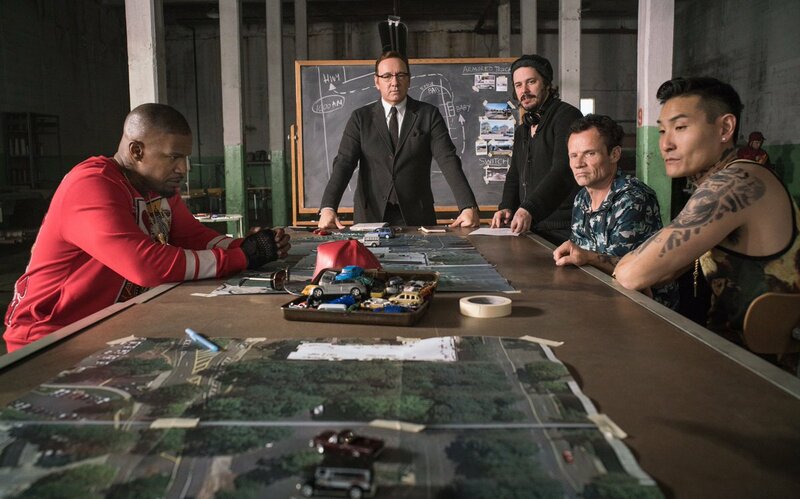 The narrative follows Baby (Elgort) - a talented getaway driver for criminal mastermind, Doc (Spacey). Having been driving since he was old enough to see over the steering wheel, we soon learn that Baby owes Doc a substantial debt - working for him until they get even. Recognising him to be the best in business, Doc has used Baby for every job since they met but the rest of Doc's crew are not so sure of his loyalty. Due to a childhood accident, Baby plays music to drown out the tinnitus; music which lays down the soundtrack to this sometimes bizarre yet beautiful mash-up of musical genre and crime thriller. Having squared his debt with Doc and found the love of his life in waitress, Debora (James), Baby wants out. However, Doc is not willing to let Baby go that easily. Insisting on one last heist, he assembles an experienced but unpredictable crew. 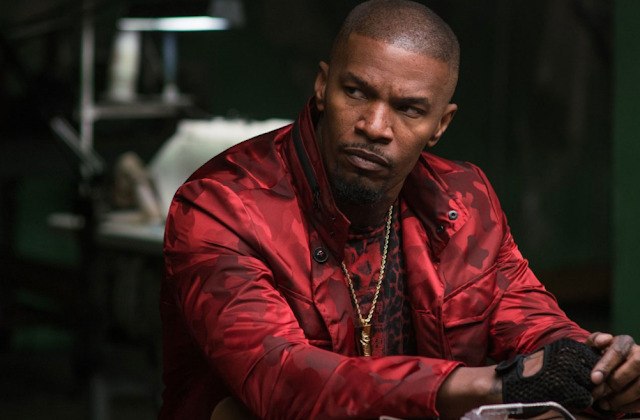 Joining Baby on the job is criminal duo, Buddy and Darling (Jon Hamm and Eiza Gonzalez) and Bats (Jamie Foxx). Essentially, Bats is just crazy. Inspired by such heist cult classics as Dirty Mary, Crazy Larry (John Hough, 1974) and Freebie and the Bean (Richard Rush, 1974) as well as musical influences from The Blues Brothers (John Landis, (1980), the standard for the entire movie is set within the opening scene. As the music kicks in, we meet Baby (Elgort) as he waltzes to a coffee shop in Atlanta. Juxta-positioned against a full-throttle car chase set-piece, we soon realise that this is no ordinary heist movie. Unlike many of its predecessors in the genre where the soundtrack is laid over a narrative, it's clear that this film is carefully constructed around selected tracks. And it's amazing. Action and spectacle aside, there is a great deal of character development and detail in every scene. Whilst Baby is ultimately a getaway driver (and therefore a criminal), it is not by choice and we are constantly reminded of his inner guilt. On several occasions he attempts to spare someone's life at the hands of his unhinged colleagues - something which isolates him from the group. Furthermore, he is haunted by his past. With his earphones in and sunglasses on, he drowns out the ringing in his ears and hides the scars caused by a childhood accident. At home, he cares for his ageing carer and makes mixes from secret recordings of gang members for his own amusement. As well as the character development of Baby, the supporting cast of characters are one of the most prominent successes of the film. Kevin Spacey’s Doc is truly a delight and, whilst he is clearly not someone to be messed with, he has the perfect balance of a calm, collected psychopath and class. Doc also acts as somewhat as a father figure - seeing real talent in Baby's potential. Then, of course you have Bonnie and Clyde-esque married couple Buddy and Darling who bring a sense of light-hearted cliché to the roles. Naturally, Darling dons her furs and pops her bubblegum but she'll have you killed for looking at her the wrong way. Buddy on the other hand, comes from wealth and power but turned his back on it all for a life of crime. Think Don Draper goes rogue with weapons. Finally, there's Bats - primarily a comedy role played excellently by Foxx but also the most sinister of them all. If we have to pick out a flaw, it would have be the lack of female presence. Whilst Debora is the primarily inspiration behind Baby wanting to leave the criminal life behind, her role is somewhat underplayed. 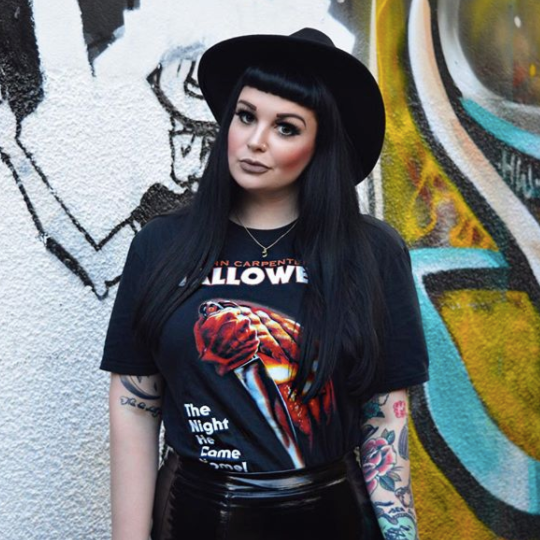 Ultimately, Debora is the personification of Baby's desires; she shares his passion for music, love of the open road and she too has suffered loss. However, there is seemingly little else to her personality. That said, James is clearly the perfect fit for the role. Their romance is pure and that of classical Hollywood. They communicate only by talking in person or via the diner phone, never mobile or text; and Baby dreams of Debora in black and white. To sum it all up, Baby Driver is easily one of the most enjoyable and original films I've seen in a long time. The direction is flawless; the cast (both supporting and leads) make for fantastic viewing and the soundtrack will leave you buzzing. Female roles aside, this highly amusing and sometimes heartwarming action thriller will probably be one of the best films you see all year. So what are you waiting for? Baby Driver hits cinemas on 28th June and gets a Sophie star rating of 5 stars. Well, that's it for another film review. 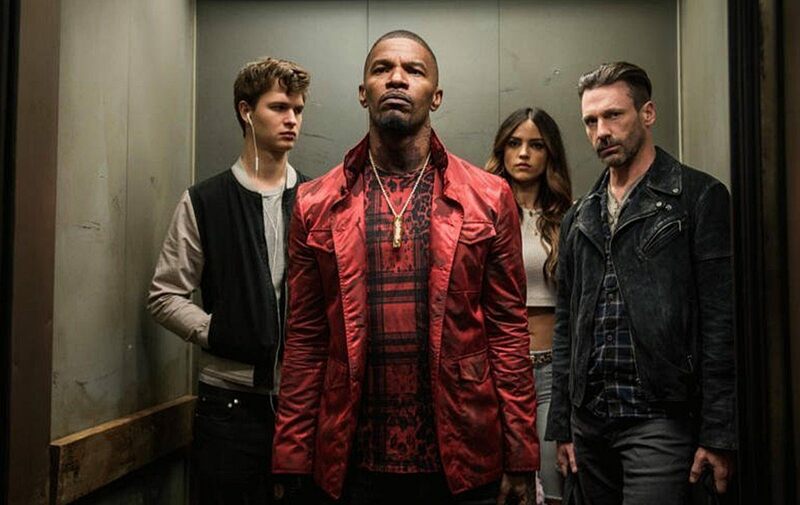 Have you seen Baby Driver yet? What has been your favourite film of the year so far? As always, I love reading your comments so please do leave me lots of lovely comments down below. Thanks so much, Gil :) I hope you're well? Definitely do see it again if you can. I think I enjoyed it more the second time around and noticed so much more detail. Have a great weekend! I haven't seen this yet, bit I need to!!! I saw The Beguiled last week and really loved that. After Lost In Translation...it's my second favorite Sofia Coppola film! A few of my favorites I've watched this year include Raw and It Comes At Night. And although it's from 2015...I saw The Brand New Testament a couple of months ago...soooooo good. I'm very much looking forward to A Ghost Story. Ah you must, it's amazing! Aw really? It Comes At Night is another I really want to see. It's out here this weekend so I'll definitely be trying to see it. I loved Raw too - really intelligent and beautifully done film.